As leaders establish priorities for the new school year, it is perhaps traditional to return to some of the same beliefs and practices that have been the guiding principles of a school or district. For several decades, standardized test scores have been the primary focus of plans and educational decisions. These numbers determined whether we had a good year or not, whether we were successful or not, whether our students met pre-established goals or not. In reality, what happens in schools should be so much greater than an annual score on a standardized test. A new book, Educational Goods: Values, Evidence, and Decision-Making, takes a completely different approach to how leaders (both administrators and teachers) can examine practices that are truly important in our schools. Helen Ladd, one of the co-authors of the book, writes, “We can fall into the habit of thinking that building academic skills is the only educational outcome that matters and the only one that schools are in a position to promote.” She states the book’s premise in one clear statement: The overall goal of education should be to equip children with the knowledge, skills, attitudes, and disposition that they will need to flourish as adults in a democracy. Along with her co-authors, Harry Brighouse, Susanna Loeb and Adam Swift, Ladd also makes the case that the development of interpersonal relationships or treating others in a respectful way is just as important as academic achievement. Their overriding conclusion is that good education decision-making must start with values and not simply be reduced to successful test taking. As leaders examine the school climate in their buildings, they may conclude that greater emphasis should be placed on lifelong character development. The beginning of a new school year may be the time to begin the dialogue among the school community to determine what the school stands for beyond numbers. A closer look at these six capacities can help schools determine which ones deserve the greatest attention in their environments. Preparing students for the labor market may be a tricky proposition for educators. Benjamin Herold examines the topic in his Education Week essay, “The Future of Work Is Uncertain, Schools Should Worry Now.” He states, “When it comes to predicting the future of work, top economists and technologists are all over the map. Inside the schools, the result is tremendous uncertainty.” With the possibility that “robot apocalypse”” can replace working-and-middle class jobs, Herold writes, “In the crosshairs: Anything that involves routine physical motion, operating machinery in predictable environments or identifying and processing data.” Despite disagreements about what educators should do, one prediction is solid: Change will happen and standing still is not an option. Teachers must be savvy; they cannot create lessons in which the teacher dispenses knowledge while students quietly sit and listen or take notes. 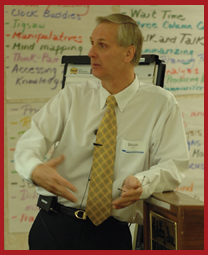 Without a moment’s hesitation, teachers must plan lessons that are challenging and student-centered; they must require students to think and problem solve; students must grapple with real world problems; there should be an audible “buzz” in all classrooms indicating that students are collaborating and exchanging ideas. “Sit and git” no longer has a place in any classroom. In fact, it should have been extinguished decades ago. Educate students well by helping them to determine how, as citizens, they can be active participants in their communities. This important message cannot penetrate student thoughts if teachers simply concentrate on facts from a textbook or from a handout. Place emphasis on opportunities for students to understand those who are unlike themselves, and to recognize similarities and appreciate differences. Additionally, include learning experiences that will build students’ collaborative skills that will contribute to a diverse democracy. Move beyond surface knowledge about the institutions and beliefs that are embedded in a democracy, e.g, the constitution, checks and balances and duties and responsibilities of citizenship. Involve students in discussions about the principles of active participation in a democracy that go beyond simply voting in elections. Promoting and understanding democratic principles should not be the sole responsibility of social studies teachers. These ideas can be included in all types of lessons. When adults set examples for students in their words, actions and lesson design, students will develop a deeper understanding of the future world they can create. It is well worth the investment of time to explore Heather’s newsletters. You will not be disappointed. They could well influence how you work with your students in the future. All dedicated educators want to observe their students experiencing personal fulfillment. In her blog, “21st Century Learning: Preparing Students Today,” Sherrelle Walker stresses the importance of helping students strengthen their cognitive skills (critical thinking and analysis), interpersonal skills (teamwork and communication), and intrapersonal skills (reflection and contentiousness). Student Information Survey: The teacher administers an information survey (readily available online), which students complete; they are then given the opportunity to share several responses with a small group of peers or the whole class. Alber, Rebecca. “Relationships Matter More Than Rules.” Edutopia. August 16, 2017. Brighthouse, Harry, Helen Ladd, Suzanne Loeb, and Adam Swift. Educational Goods: Values, Evidence, and Decision-Making. Chicago IL: The University of Chicago Press, 2018. Clayton, Heather. “Let’s Hear It For Activism!” Making Standards Come Alive! March 2018. Clayton, Heather. “Let’s Hear It For Civility!” Making Standards Come Alive! January 2018. Clayton, Heather. “Let’s Hear It For Empathy!” Making Standards Come Alive! November 2016. Herold, Benjamin. “Automation and Article Intelligence Are Disrupting the Labor Market. What Do K-12 Educators and Policymakers Need to Know?” Education Week. September 9, 2017. Mossman, Iain. “Dignity and Respect in the Classroom.” The Learning Hub, Cardiff University. February 17, 2017. Reimers, Fernando. “From a Nation at Risk to a Democracy at Risk: Educating Students for Democratic Renewal.” Educational Plus Development. The Brookings Institution. May 2, 2018. Walker, Sherrelle. “21st Century Learning: Preparing Students Today.” The Science of Learning Blog. Fast ForWord. August 28, 2012. Oliver, Bruce. “School Should Be So Much More Than a Test Score.” Just for the ASKing! August 2018. Reproduced with permission of Just ASK Publications & Professional Development. © 2018. All rights reserved. Available at www.justaskpublications.com.